A commercial or private venue used by a lot of people easily gets dirty. The only way to keep it less stressful is by hiring professionals like our pool drain cleaners. Investing in our services will ensure that your pool looks impeccable no matter how often it is used. Our pool drain cleaning company provides specialized products specifically designed for pool maintenance. You have a lot to benefit from our expert service which is not easy by inexperienced hands. Let us know how we can improve your pool on (925) 269-9399. Reasons you need professional pool drain cleaning. The first advantage is that your pool maintenance will be done correctly. We base our techniques on strict industrial standards and we ensure that our supplies meet the necessary requirements. Our processes are thorough; all geared towards client 100% satisfaction. If you hire us, you can rest assured of a properly done job. We will not put your pool at risk of cracking because we make quick draining and refill before the tiles are over-exposed to air. Besides, we understand the right techniques for any type of pool. When it comes to removal of impurities, contaminants, and debris, we know exactly what it takes to produce the best results. We are thus giving you an opportunity to enjoy a healthy and clean pool every day. Health and safety of commercial pools. Commercial facilities are supposed to comply with specific safety standards. If you run a commercial or industrial pool, you are responsible for providing the necessary working conditions. Our pool cleaners know how to deal with different venues and will ensure a hazard-free environment for your business. Our experienced cleaners are familiar with all maintenance requirements of commercial properties and will help you remove any workplace hazards. This is a good way to maintain good reputation of your facility and provide your workers and clients with optimal working conditions. Don’t stress yourself over pool draining and cleaning. 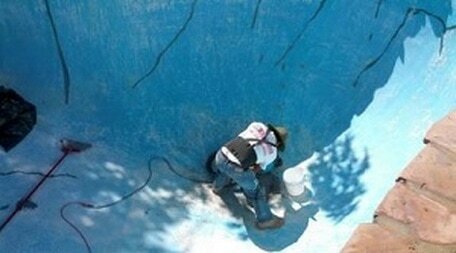 After hiring a professional company to take care of your pool, you don’t need to think about the messy task anymore. You can then proceed to more important tasks of running your business or family care. We are flexible and can adjust our program depending on your schedule. You also have the privilege of choosing the type of cleaning you may be interested in, the schedule, and even hours that are most convenient for you. We are equally suitable for small and large pools and we tailor our services to your specific needs and budget. The result you get is a highly satisfactory service and nothing superficial added to it. The technicians that we send to take care of your pool are not your business and we will be responsible for their payments and insurances. You don’t have to man them or supervise their job. Just relax and enjoy their services. Safety, health, and swimming pools are connected to cleanliness and sanitation. It makes sense to outsource the services as you will obtain splendid quality as well as good value for money. Do not be reluctant to ask for our reliable and polite services because we understand your specific needs and are ready to give the best solution. Call us if you suspect any of these things on your pool. The pool turning green: this is a sign of negligence. This is a condition that needs prompt treatment before it becomes a huge health hazard. If we find this issue in your swimming pool, we first capture all debris using a leaf net. Then we apply chemicals like chlorine to sanitize the pool. Chlorine can kill algae and other pathogens. Too high or low alkalinity: the pH level of the pool requires adjustment to avoid issues like corrosion and foam formation. Foam normally develops at high pH while corrosive effects are prevalent at low pH. A dirty pool requires specialized treatment. We normally apply chlorine after draining a very dirty pool. We also ensure that the filtering mechanism runs for a day, followed by backwashing which is done three to five times every day for optimal results. A pool that has been backwashed severally clears fast, normally within a week. During summer, people prefer to relax at the swimming pools. Over the years, we have been maintaining swimming areas for guests and families. For both above ground pools and in-grounds, we have specialized equipments and products to carry out a thorough service. Talk to us today to see how we can help. (925) 269-9399.